As much as I love fall, I truly hate (yes, hate), how the days get shorter and shorter as winter approaches -- darkness when I wake up, darkness when I leave work. Ugh. My 35 minute walk to work is my one chance to enjoy the sun, and scope out the fresh produce in the market along the way. I first spotted these grapes about a month ago and was totally tantalized by them. I had high hopes of working them into a variety of dishes -- I tried oven roasting them for a salad, but the result was far too sweet for my salad preferences; I thought about pan frying, but knew the grape wouldn't hold up well to the heat; I was inspired by some gorgeous local focaccia, but didn't have the hours to dedicate to rising dough (next time). 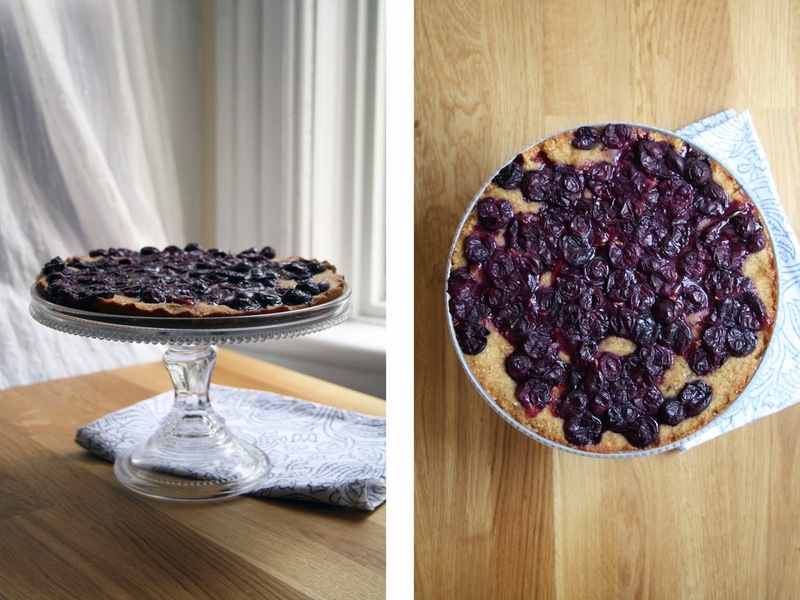 So I settled on a simple tart -- a fairly basic crust, allowing the grapes to dominate in all their sweetness and glory. In a bowl, combine the almond meal, spelt flour and ginger. Stir to combine. In a small pot over low heat, melt and gradually brown the butter. Remove from the heat and bring to room temperature. Whisk in the egg yolk, vanilla and maple syrup. Pour the wet mixture over the dry and mix just until combined. Lightly butter your springform pan. Transfer the batter and spread evenly throughout the pan. Place in the freezer for 30 minutes. Remove the tart from the freezer, and fill with grapes. Use a pair of scissors to cut and evenly distribute about 1/3 of the rosemary spring throughout. Sprinkle with turbinado sugar. Bake for 30 minutes. Increase the heat to 325, and bake an additional 5-10, until the edges are golden brown. Remove from the oven and let cool on a wire rack. If your grapes didn't explode, using the back of a spatula, gently (and carefully) press down on the grapes to force them to burst. Serve warm. Or as a room temperature snack the next day.